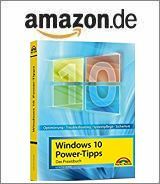 [German]Microsoft has released on March 8, 2017 another mysterious update ‘Microsoft – WPD – 2/22/2016 12:00:00 AM – 5.2.5326.4762’ for Windows 7, 8,1, 10. Some users are reporting issues with mobile devices after installing this update. Here are a few details. I received yester evening an e-mail from a blog reader informing me about this new update (I haven’t received it yet on my machine). The date for this update is February 22, 2016. Searching the web gave me some hits, but without further details. The abbreviation WPD stands for Microsoft Windows Portable Devices. WPD drivers enables the communication with connected mobile devices and storage media (see also). WPD driver should exchange Windows Media Device Manager (WMDM) and Windows Image Acquisition (WIA) drivers for mobile devices and scanners. Currently I haven’t found details about that update on Microsoft’s web pages. At TenForums is a longer discussion about this package. Weighting the experiences with previous INTEL driver updates, my recommendation is, to block installation of this package. In Windows 10 use the instructions given within my blog post How to block Windows 10 updates. The 8,5 MB CAB file contains driver for Windows USB support for MediaTek Android devices. Other .inf files contains information about MTP protocol support via WPT driver. But I was wondering why the package also contains outdates USB2Ser drivers (and the inf files contains comments from 2011). Also an RNDIS-over-USB host driver for Intenet Sharing device comes with an .inf file dated at 2011. 1. Open Device Manager (devmgmt.msc). 2. Right click on your phone listed in Device Manager, and click on Update driver. 3. Click on Browse my computer for driver software in wizard. 5. Check the Show compatible hardware check box, then select MTP USB Device, and click on Next. If that doesn’t help, try to reboot Windows and test, whether the phone is accessible via MTP from Windows. Within this Microsoft Answers forum thread some user reported update error 0x800f0217 – but I have seen similar reports. The users should be glad that the installation fails and should use the instructions given within my blog post How to block Windows 10 updates to hide the update. I got the issue too with this broken MTP driver update and my Android phone will no longer connect to the PC. Going to the device manager, showing hidden devices, making sure the phone is not plugged on USB, and removing the “ghost/gray” driver, then plugging the driver again, Windows Update will search and find a matching drier for my LG phone, will try to install it, but will fail also while adding MTP support to the device. Also I’ve just noted that my PC has 3 hidden network interfaces, which are not listed in the PowerShell cmdlet “Get-NetAdapter”, but are using names like “Ethernet”, “Ethernet *1”, and “Ethernet debug”, but my real interface is now “Ethernet #3”. It’s impossible to remove these adapters, or rename them, they are active but have no active IPv4/IPv6 routing or addresses. They look like backdoors ! Note that none of them was associated to a VM I know (but they could be associated with a hidden VM started in Hyper-V and probably hosting most of the code of the “CIA Vault 7” backdoor). I’ve found also weird user SUID in the registry, with some hidden files locked permanently, not listed in any directory with a visible name. Trying to erase the disk clusters (booting from a safe DVD image without mounting the system disk) where they are located to make them inoperant does not work: they are still there, and the content of these clusters are restored as soon as I reboot Windows, even though I checked that they were cleared by rebooting several times from the safe DVD. A possible workaround could be to use system restore to wind back to a restore point before the update has been installed and block the update (see How to block Windows 10 updates). But I fear, in Windows 10 system restore won’t work due to my article Windows 10 Update KB3213986 kills system restore. But we have to wait and see, if that’s true. Addendum #1: There is now also an article at InfoWorld about that update – but without too much details till yet – (side note: I’m in touch with the article author, see also the discussion at askwoody.com). Addendum #2: Some users are asking, why the driver don’t get offered on their system. The reason seems simple: Windows Update pulls the driver only, after a mobile devices are connected to the Windows machine. The driver hasn’t been offered on my Windows 7 SP1 production machine during writing the initial version of my German blog post. Later on I’ve had connected a Nexus 4 smartphone to this machine via USB cable – and suddenly the driver popped up in Windows Update as an optional update. I got also a comment from a German user, claiming that the driver update has been offered as an important update in Windows 8.1. There is a pitfall in Windows 7/Windows 8.1 update settings. If the option Give me recommended updates the same was I receiving important updates (see screenshot here) is checked, the update will be flagged as important. Addendum #3: Microsoft has published now a short statement within Microsoft Answers forum about that issue. Microsoft recommends the workout I’ve published above. But they described also a way to remove the faulty driver from driver cache (preventing a re-install). I’ve covered this topic within my blog post Microsoft’s Fix for the ‘Microsoft – WPD – 2/22/2016 12:00:00 AM – 5.2.5326.4762’ driver issue. I had this same problem today (3/8/17) with my Kindle Fire HD unable to make a USB connection with my Windows 7 desktop. Earlier today the Microsoft recommended update (WPD – 2/22/2016 12:00:00 AM – 5.2.5326.4762) failed to install four times so I hid it to keep it from trying again. But then my Kindle’s USB connection stopped working, although it continued to work fine with my old Windows Vista machine. Mr. Born’s Device Manager fix worked for me the first time. Thank you, thank you, thank you . . . It works fine to me! We don’t know why this driver has been pushed out to users via Windows Update, as Microsoft has provided no information about it. If you have yet to install this driver, the best advice is to avoid it. If you have installed it, and are having problems, it’s worth rolling back your system using System Restore.